I am thrilled with Dubai's new public transportation system, The Dubai Tram. I remember getting so giddy when I saw it on trial run for the first time. Although I won't be using it on a daily basis as I live and work far from the tramway, it still spells out comfort and convenience to me. Having the tram simply means no more long walks to my favorite beach and no more expensive taxi rides to hard-to-reach attractions! So, it when it was finally launched last week, I excitedly made my way to the Marina to check out Dubai's newest mode of transport. The Dubai Tram runs from Dubai Marina to Al Sufouh. 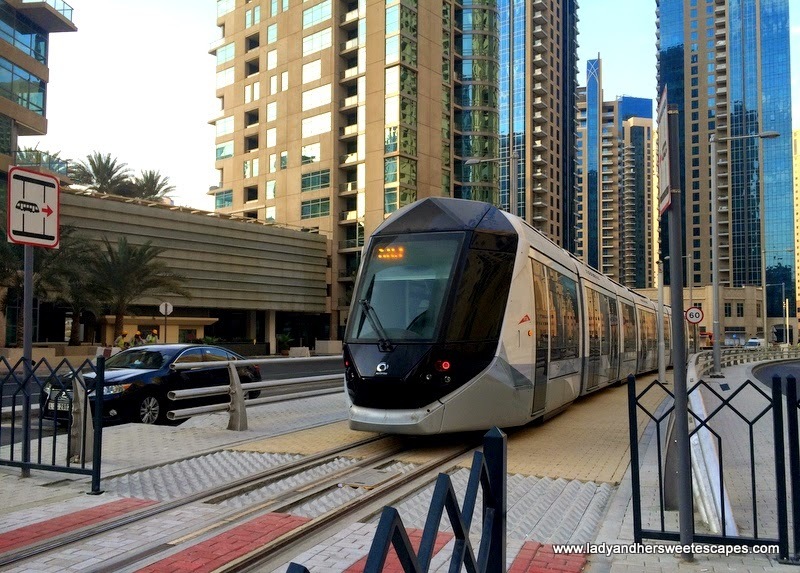 There is a tram loop with a single track covering JBR and JLT from Dubai Marina. There are 11 tram stations, two are linked to Dubai Metro's Red Line (Dubai Marina and Jumeirah Lake Towers stations) and a link to the Palm Monorail. As of the moment, there are 11 trams are in operation. Each tram has seven cabins; one for gold class, two for women and children and four for silver class. A single journey fare is at 3 AED for silver NOL card holders. Tram timings are at 6:30 am to 1:30 am on weekdays, and from 9 am until 1:30 am on weekends with 10 to 12-minute interval between trams. The tram stations are air-conditioned and have automatic screen doors. The platform is equipped with ticket machines, seats, information panel and NOL card validation booths. This station is a part of the single track tram loop. Nearby attractions are The Walk at JBR; an outdoor shopping and dining destination near the coast and The Beach; a low-rise complex adjacent to JBR beach. You can also hop off in this station if you're heading to The Walk and The Beach. This tram station is connected to JLT metro station. A short walk from Exit 1 is a well-recommended Vietnamese restaurant Hanoi. As the name implies, this is the station for shoppers heading to Dubai Marina Mall. The Address Marina and Radisson Blu hotels are also nearby. This is where the single track tram loop ends. This station is connected to Dubai Marina metro station. A short walk from this station is the Marina Walk; one of the best places to dine alfresco as it is situated across a yacht club and the world's tallest twisted tower (Cayan Tower). Residences and hotels are in the vicinity. This station is adjacent to famous beachfront hotels like Le Meridien Mina Seyahi where Barasti Beach Bar is and Westin Hotel. Hop off this station if you're heading to a concert at Dubai Media City Amphitheater. Arjaan DMC is also close by. This station provides easy access to the Palm Monorail. The monorail will take you from the base of The Palm Jumeirah, then to the fronds, and up to the crescent where Atlantis is located. Near this station is Dubai Knowledge Village; a free zone area dotted with universities and institutions. As of the moment, the tram ends in this station. Burj Al Arab is insight, but it would take a long walk to reach it. Other than that, there's nothing much to see nearby. Ed and I rode the tram on a Saturday evening. We have always been curious with the tram routes, hence we covered all stations! :) We started in Dubai Marina station which is connected to the Metro via a footbridge. The tram station is quite similar to that of the metro, only smaller and has easy to overlook NOL card readers! It doesn't have gates that only open when a NOL card is tapped. The validation systems are in the platform beside the ticket machines! The tram cabins are very spacious. We were seated in a carriage that has a luggage rack, a space for wheelchair and priority seating for the elders and pregnant women. The seats are plush and very comfy, just like the ones in Dubai Metro. The tram runs at an average commercial speed of 20 kph. Our journey to Al Sufouh was nice but slow. What I mean is, it ran smoothly without any wobbles yet in a leisure speed. On our way back to Dubai Marina, there were some technical problems which led to longer tram intervals. As it was a couple of days after the launching, I guess having some minor flaws is acceptable. But while there are still glitches to be fixed, the tram is not a good choice when you're in a hurry. Fingers crossed, the Dubai Tram will be as efficient as the Dubai Metro anytime soon. * Tap in and tap out your NOL card at the validation booth in the tram station to avoid being fined. * Just like in the Metro and in the bus, eating and drinking are prohibited. * As a pedestrian, do not use headphones and mobile phones near the tramway. Cross the tracks at the designated pedestrian crossing. * Do not litter on the tram tracks.